The first thing I worked on was getting the printer to work. The entire project hinged on being able to print images on a printer designed for text and simple logos, so I wanted to evaluate that aspect of the printer before getting too involved. I picked up the printer from Adafruit, and tried out their Arduino library. 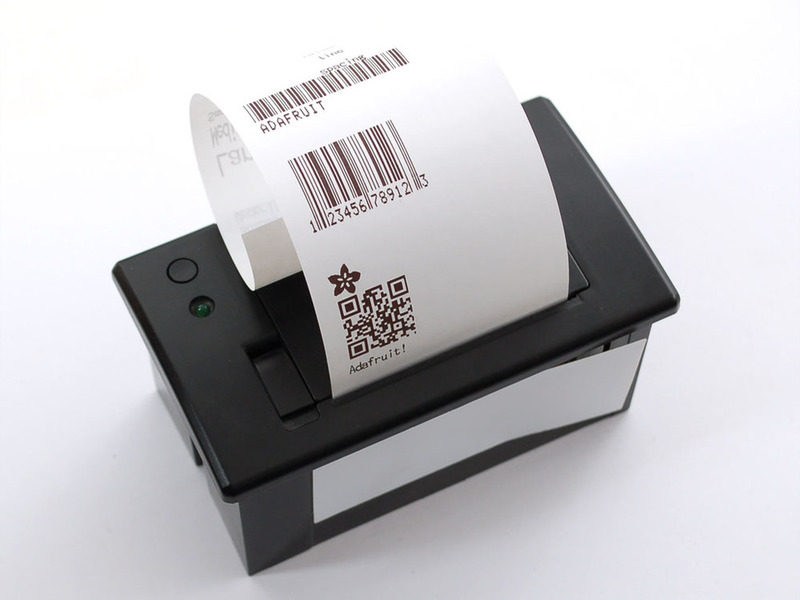 The library includes code to print text in different fonts, barcodes, QR codes, and bitmap images. Their example printed a small Adafruit logo, so I hijacked that portion of the code and inserted a “grayscale” image. This printer is not capable of printing anything but black or white pixels. 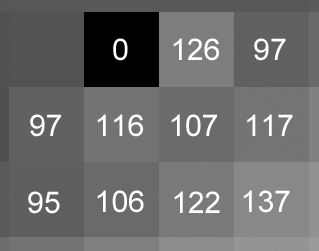 The best way to give the illusion of grayscale is to “dither”. In image processing, dithering is a method of giving something the appearance of grayscale by alternating black and white. I’ll go into details later about how this is done, but for my early demo, I used the application HyperDither for OSX. Though it’s wasn’t great, it was definitely passable. 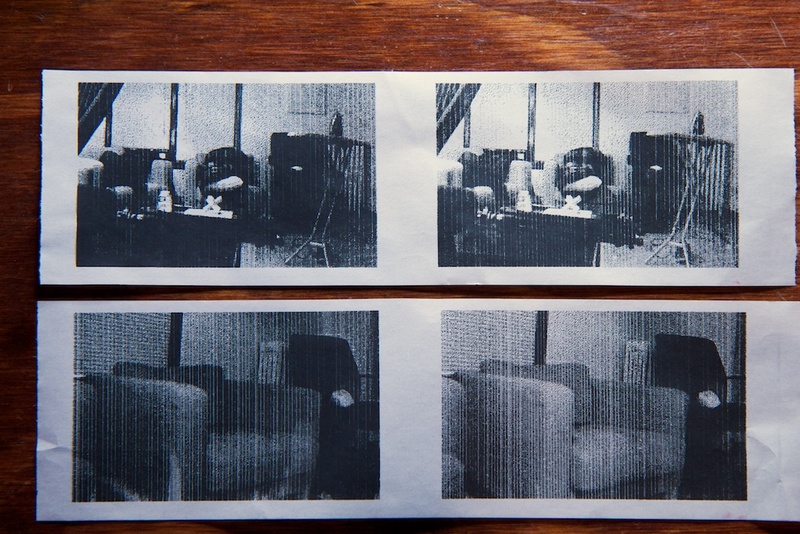 The images all end up with horizontal bars across them, but the printer is actually pretty darn precise. 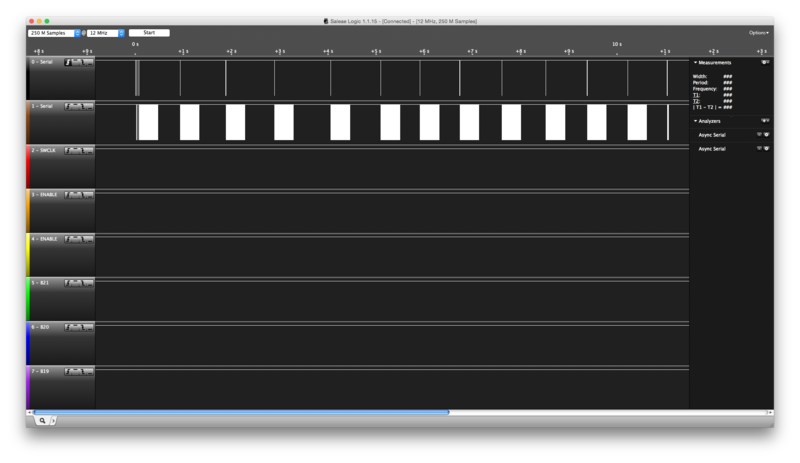 The next big challenge (or maybe the only big challenge) was getting my firmware to decode JPEG. The camera module from Adafruit is a little weird. I get the feeling that it’s not really meant for still images. For starters, it has a coaxial video output that allows you to get a live video feed. I’ve never hooked this up to anything, but I think still images work by first freezing the video (buffering the current frame) and then compressing that frame and transmitting it over a UART. While JPEG compression is a bit of a pain to work with when compared to straight bitmap, it can substantially reduce transmission times. The camera’s 640×480 images usually come out to around 40-50kB. An uncompressed version with 8 bits of color per channel would be close to a megabyte and take 20 times longer to transmit. The JPEG algorithm is based on both mathematical and physiological shortcuts. It is not a lossless format, so the image reproduced is not the same as the image going in. The hope is that the changes are subtle enough that a human viewer won’t notice the difference. For example, humans are more perceptive of small changes in brightness over small changes in color, so color information is more highly compressed. 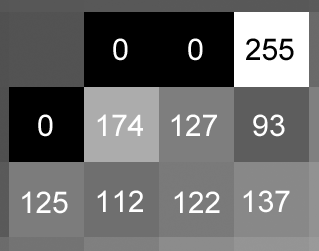 Because I only needed brightness information (grayscale), I was hoping to find a way to optimize my decompression to ignore color info and possibly decode faster. Digging into the JPEG decompression algorithm, I pretty quickly realized that I was not going to be writing my own decoder (similar to how I felt with the FATFS for the Gutenberg clock). There are a ton of JPEG decoders available including one from the Independent JPEG Group who released their first version in October of 1991, but few of them are deigned for small embedded devices. With just 64k of memory, many of them won’t work on my processor, and some even include calls to the operating system while my camera has no OS. I found PicoJPEG which is a barebones JPEG decompression tool that can run on limited hardware and doesn’t require any hooks into an OS. To begin testing this code, I needed an image to work with. I grabbed one of the test images on Adafruit’s site and wrote a simple Python script that just takes in the JPEG file and spits out its raw contents in an array that can be copied to a C file. The STM32F407 on the Discovery board has 1MB of flash and 192KB of memory, so a 47,040 byte array was no trouble. Getting this code to work was surprisingly easy. The software is written to run with a filesystem, so there is a function called “jpeg_need_bytes_callback()” which is supposed to grab the next chunk of compressed data from the filesystem to continue processing. 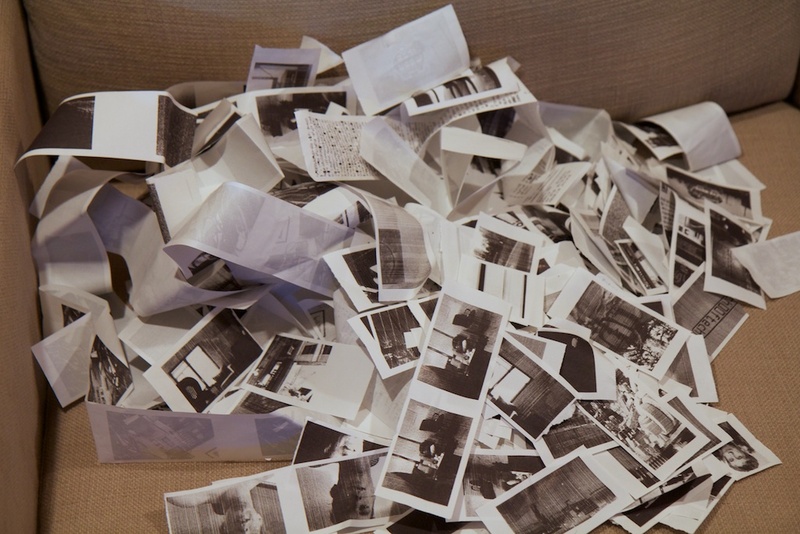 This way, there’s never a need to keep the entire image in memory. All I had to do was modify this function to pull bytes from my array instead of the filesystem, and it happily ran to completion with no errors. Of course, I had no way to actually view the image yet which was my next task. 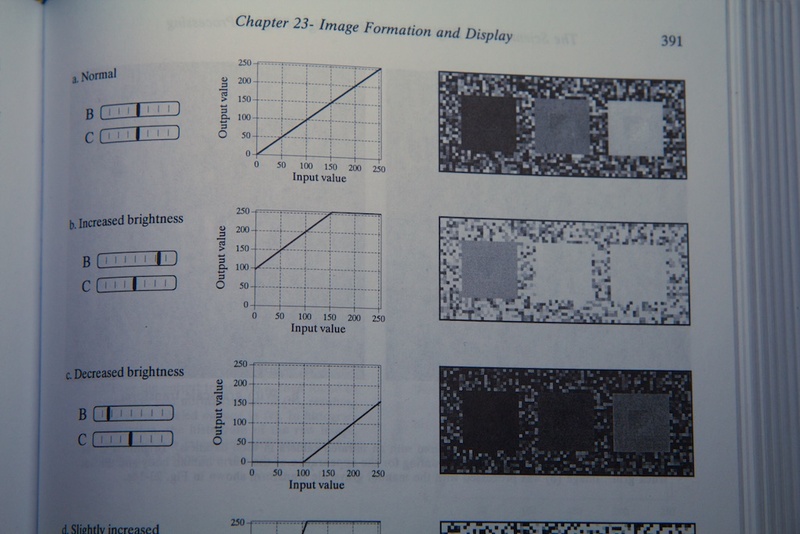 The first step to getting a full color image through a black and white printer is to convert it to grayscale. Image data is decoded in 8×8 pixel blocks from left to right top to bottom. When one of these blocks comes in, PicoJPEG produces three arrays that contain the red, green, and blue pixels values of all of the pixels in that block. 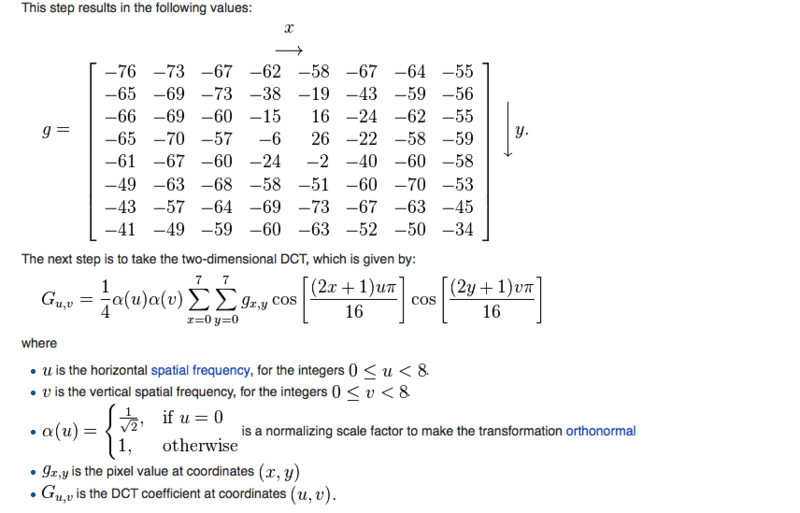 The task is then to pair these down into a single array that contains just grayscale information. But which of the three do you use? The green portion of an image will look very different from the red or blue portion. 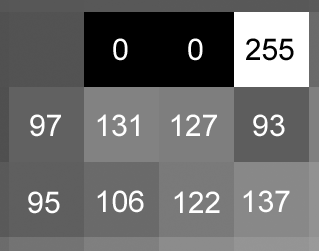 My first guess was to just average the three values, but I learned that this isn’t right either. 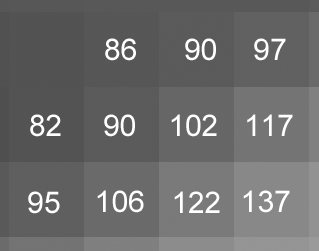 Properly converting RGB to grayscale involves weighting each color channel in accordance to how sensitive your eye is to that color. Human eyes are very insensitive to blue, so you want to gain down blue’s contribution to the grayscale image. Here’s a version of the test image using two different algorithms. As you can see, the first grayscale image looks weird. For example, the lettering in “Wendy’s” doesn’t stand out as much as it should. You’ll notice that I used “210” when I should have used “0.21”. The STM32F105 does not have a float processing unit which means that it is super slow when performing math on decimal numbers. 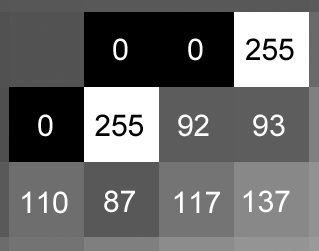 Rather than using floating precision, I opted to use fixed precision by just multiplying everything by 1000 and just pretending the decimal place was three spaces over. As a side note, the STM32F407 does have an FPU, but I got a hard fault every time I tried to enable it. I ended up leaving it disabled using “-mfloat-abi=soft” in the Makefile, but it’s something I want to look into in the future. 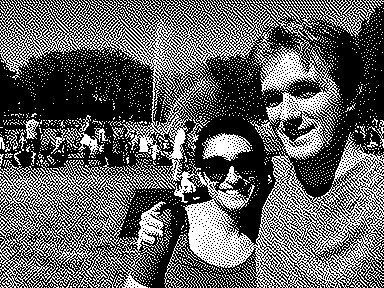 The next step is dithering. The word “dither” comes from the word “didderen” which means “to tremble”. Its use in computer science dates back to WWII where it was found that the mechanical computers used to aid bomber pilots performed better in the air than on the ground. 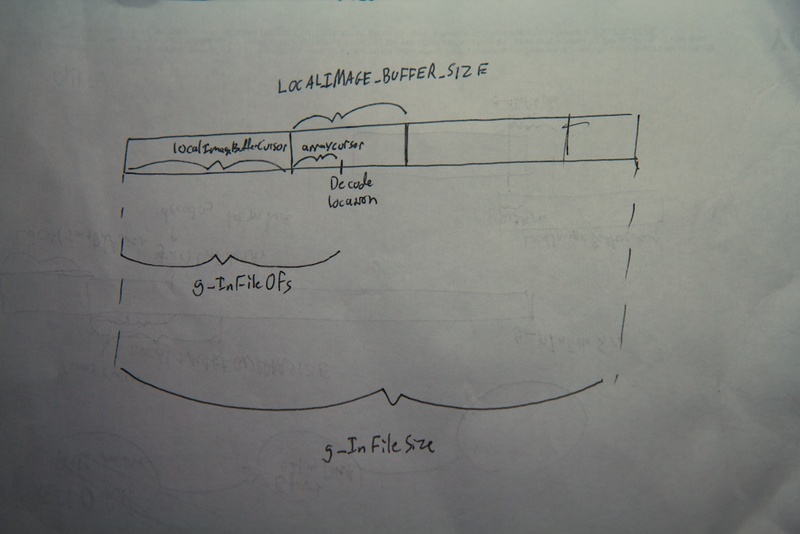 The explanation for this phenomenon was that the vibration of the airplane prevented the gears inside the computer from getting stuck in an intermediate location. Small perturbations unseated the gears and caused them to shuffle into the correct position. You might have experienced something like this when measuring out flour. By tapping the side of the measuring cup, you’re introducing noise and forcing the flour to settle into a discrete position. In the context of image processing, dithering is doing the equivalent by nudging a gray pixel and forcing it to be either white or black. 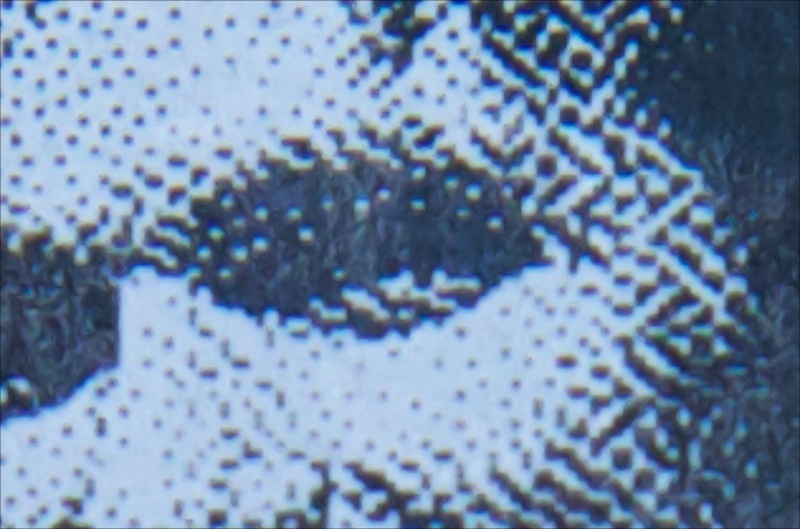 To improve the image quality, the error (how far it was from white or black) is combined with the surrounding pixels nudging them closer to black or white. You can see how whenever a pixel gets blacked or whitened out, the surrounding pixels get slightly brighter or darker to compensate. In this way, gray is approximated with alternating black and white. 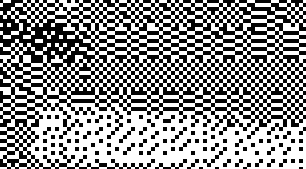 This produced visible artifacts at the boundaries of each 8×8 block inside of which there were often repeated patterns. This is a result of two adjacent blocks being very similar and coming up with similar solutions for the same shade of gray. I did all of this iterating in Python which made it easy to see my outputs immediately. Once I was happy with the result, I just converted it to C and dropped it into my code. After a few missteps with color polarity and block orientation, I could print the image! 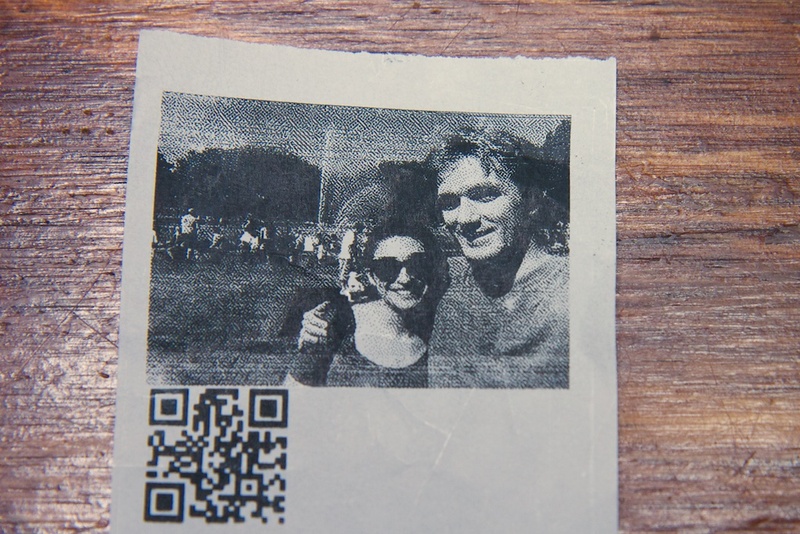 While it was pretty awesome to see the right picture come out of the printer, I immediately noticed a problem. 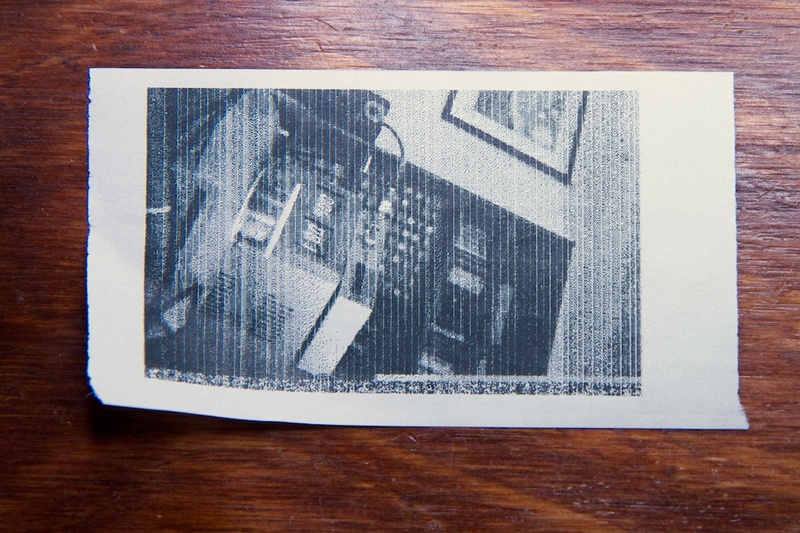 The image is 640 pixels wide, while the printer only has 384 horizontal pixels to work with. This means that I was cropping 40% of the image. In the final version, it decompresses and dithers the entire image and then crops off the top and bottom 10% to make it fit. What you see above was all worked out on the STM32F4 Discovery board. One detail that I absolutely needed to know when picking out a processor was how big the images were. Since I was copying the entire image into RAM before decompressing it, I needed to make sure that I had enough memory to hold the entire JPEG as well as run the main program. JPEG compression rate depends heavily on image content. Images with finer details tend to not compress as well as those that have less texture. Throughout testing, my images rarely got above 47 or 48k. With this information, I settled on the STM32F105 which has 64k of memory. It felt kind of scary getting that close to 100% full until I realized that the 16k remainder was larger than I’ve had to work with on any of my AVR projects. Even the QR clock only had 1k of memory. This seemed to work pretty well, but working late at night, I noticed an intermittent issue where my firmware would hard fault and crash. I started blaming the debugger again because sometimes it would succeed if I wasn’t debugging, but there wasn’t much of a pattern to its success rate. 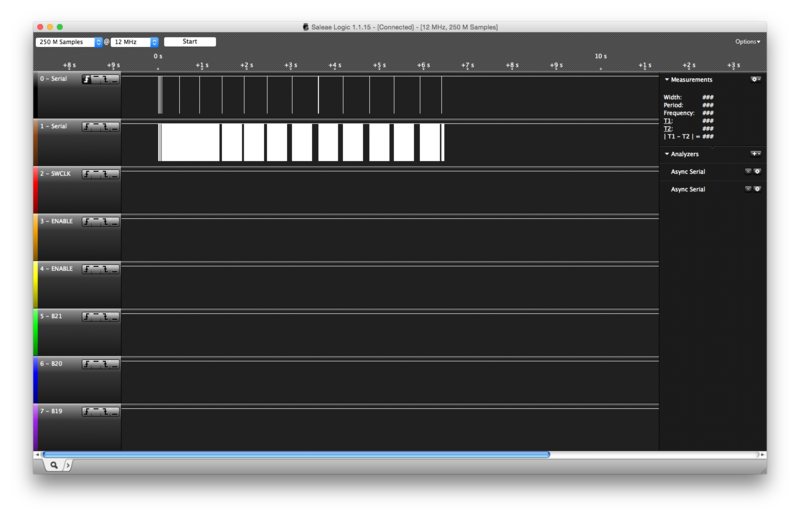 Just to verify, I grabbed my logic analyzer and started tracing the UART data coming from the camera. What I found was pretty devastating. While most images were 47-48k, every once in a while, I’d get one over 64k. In a dark environment, the camera’s built-in gain controller boosts image brightness in an attempt to resolve more detail with little light. Boosting gain also boosts noise, so the resulting images were very noisy. 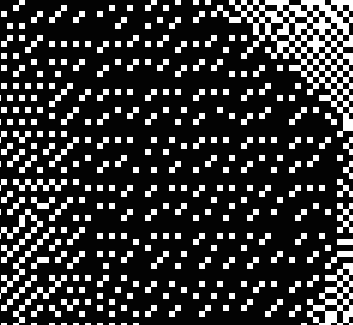 Noise consists of a bunch of very fine random variations to pixel values, and it doesn’t compress well. So here I was, having just assembled a custom PCB and figuring out that it wasn’t going to work. To make matters worse, the STM32F105 doesn’t have any other pin-compatible variants with more memory. Fortunately, I discovered that the camera module stores the currently buffered image indefinitely, and you can request whatever portion of the data you want. 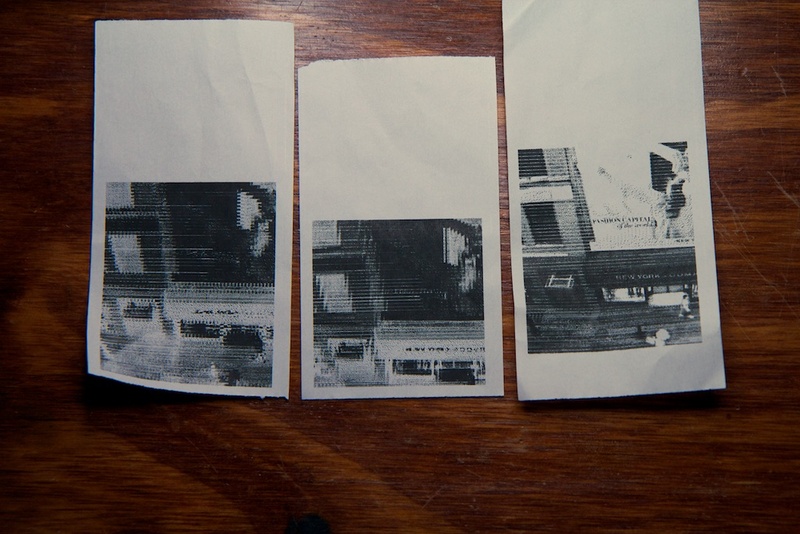 The solution was to grab small portions of the image (4096 bytes at a time) and decode on the fly. The plus side was that PicoJPEG is already written to request data from disk, so I just had to swap out that code to request data from the outside device. The camera module isn’t without its faults however. 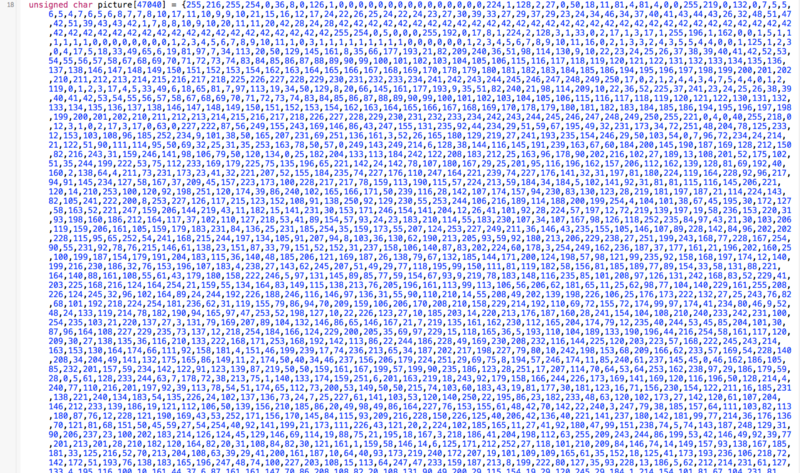 As a completely undocumented feature, if you ask for a section of the image starting with a byte address that is not divisible by 8, it will deliver bytes starting from the nearest address that is. The upside is that this fix partially resolved another bug with the camera module. The camera supports a number of different baud rates up to 115200, but I found that when transmitting at those speeds, images would sometimes get corrupt. The funny thing is that since JPEG is a sequential decoding scheme, the camera would successfully print the broken images. They’d just have a bunch of garbage starting somewhere near the bottom. Looking around online, I found that I’m not the only person who had this problem. This camera is seriously screwy. Over long transmissions, a poorly calibrated serial clock could lose time and send out a bit slightly out of time. The processor on the camera can’t sustain that data rate for so long and eventually has to start managing background tasks which interfere with transmission. Either way, grabbing the image and processing it in portions both reduces the length of each transmission and provides some “cool down” time between transmissions while the camera is processing. 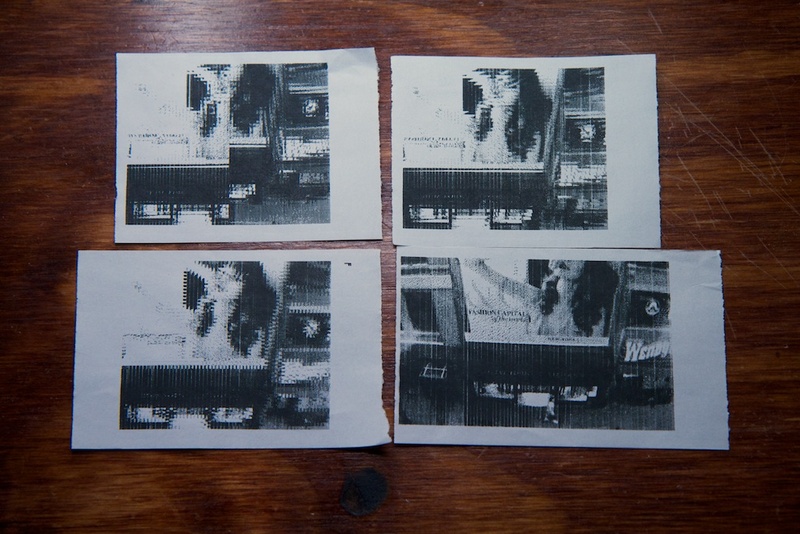 While having a printer camera was cool, I was sort of bummed about the quality of the images I was getting. 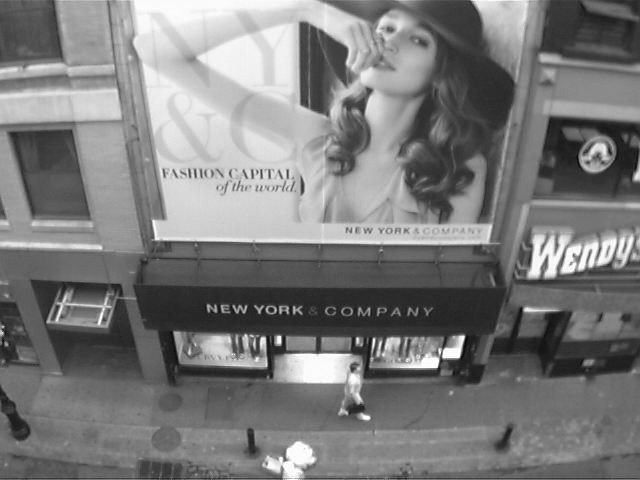 Large dark sections of the image tended to bleed together. I think it’s a result of the printer body itself heating up and blackening the paper even when the local heater head isn’t active. I needed a way to generally brighten the image to prevent this from happening. I tried a few things originally like simply taking every pixel value below 10 and rounding it up to 10 or changing the cut off point on the dithering algorithm from 128 to 80 forcing more pixels to be pushed to white. While these did brighten the image some, they also reduced contrast and made the pictures generally worse. The concept is pretty simple. 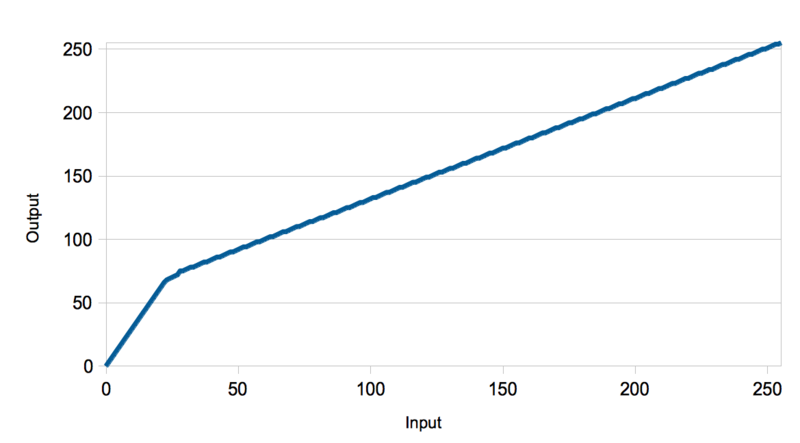 You can make a curve that maps every possible input value (0-255) with an output value. I sort of did this before when I mapped every input value below 10 to 10, but doing it as a curve gives you a much finer level of control. Despite the “instant” nature of the camera, it was actually pretty slow. The printer itself takes about 18 seconds to spit out full image. While it would be nice to make this faster (I’ll have to call Nordstrom), it’s pretty fun to watch, and I think seeing the image print out in real time is a fun part of the experience. What isn’t fun is the 10 seconds it takes for the STM32 to grab the image off the camera module and decompress the JPEG. During this time, the camera just sits and blinks an LED. There are probably a lot of things I could do to optimize the JPEG decompression if I had any idea how JPEG actually works, but it’s all moot anyway because the camera can only transmit as fast as 115200 baud which means that it will take a minimum of 4.5 seconds just to grab the 50k or so bytes of the image. This is super slow and yet another reason why I think the camera module isn’t really meant for still pictures. The white blocks are periods where data is being transmitted and the gaps are when the processor is decoding. There are two ways I can think to make this work. The first is to handle data reception via interrupt. Similar to the AVR, the STM32 can be set to trigger an interrupt when it receives a byte of data over serial UART. The processor can then pause whatever it’s doing, go grab the new data, and then resume. While that’s pretty cool, it actually cuts into my processing time as it takes a little bit of time to switch tasks like that. A much better solution utilizes a feature you won’t find on an AVR: the DMA. DMA or “Direct Memory Access” is a component built into some processors that allows applications to directly interface memory with an external port without tying up any processor resources. With a DMA in place, I could have the processor fill up a buffer with image data while it’s processing another buffer from before. This wasn’t super trivial as it involved managing two separate buffers and also dealing with all of the weirdness of the “address not divisible by 8” rule of the camera. Furthermore, I had to make the code smart enough to know when it’s time to switch buffers while still providing a continuous stream of data to the decoder. As you can see, the data transmission sections are much more tightly packed. While there are still some gaps that could be shrunk, there’s only about a seconds worth of speed improvement left before you start running into the limitations of the UART. Unless something jumps out at me looking for optimization, I’m going to stick with this code.